Dichter Pharmacy is a long standing Inwood establishment--a place where one can have a professional conversation with Manny, the owner and pharmacist, and have enjoyable shopping experience where all your health care needs are met! We are FAMILY FRIENDLY, bring in your kids and sit at the soda fountain. The BRIGHT, inviting and comfortable atmosphere is geared for the INWOOD family of ANY size. We have expanded MANY product lines and if you don't see what you want, we will get it for you quickly and at a fair price. We have FREE pick up and delivery. Hablamos Español! Come in and let me help you feel better! Gracias! 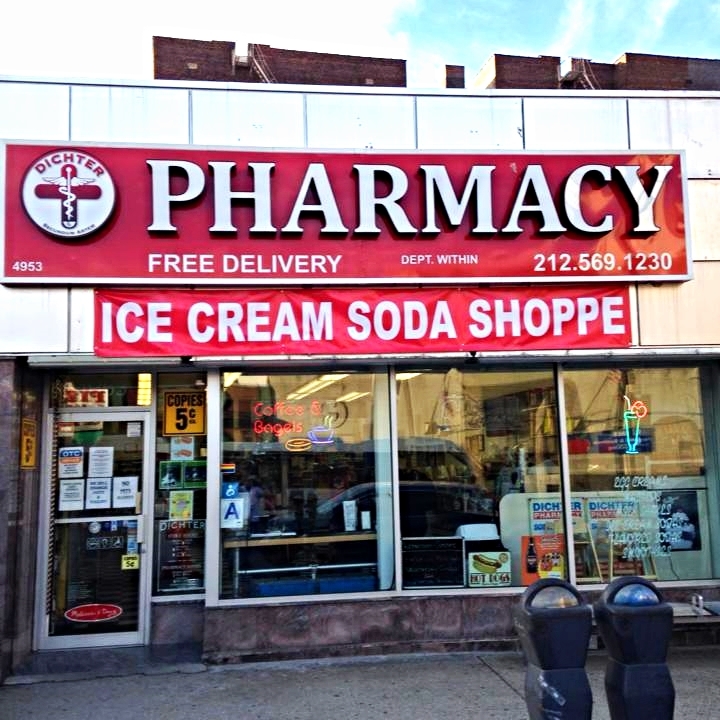 Dichter Pharmacy is neighborhood pharmacy located in the Inwood section of New York City. We have been here for over NINETY years. We help our customers as we would help our own family. No amount of advertising can match a customer's praise. We strive to maintain that trust. Please don't forget to visit our brand new soda fountain counter! Find out more about Dichter Pharmacy and it's history in the Inwood neighborhood. Click here to get a little more information about Dichter Pharmacy through news links, photos and videos! Click here to find out more about what Dichter Pharmacy provides its customers. Manny Ramirez is owner and Head Pharmacist for Dichter Pharmacy but there's a lot more floating around in his noggin'. Find out more. Find out what kinds of services we provide OTC and Pharmacy customers and much more! Dichter Pharmacy is involved in its Inwood neighborhood. Find out about events it holds and other community services it provides.